2.Mix the flour, sugar, butter, milk, eggs and baking powder together. Spread the flour mixture (the crust) evenly into the prepared pan. Spread the fresh blueberries on top of the crust. Thoroughly mix the vanilla, cream cheese and sugars. Gently spread the cream cheese mixture over the blueberries with a small rubber spatula and yours fingers. 7.Mix the cinnamon, sugar and walnuts, if using, together. Sprinkle the cinnamon/sugar evenly over the cream cheese and blueberries. Bake 35-40 minutes or until the topping is golden but not brown or until an inserted knife comes out clean. Allow to cool completely prior to cutting into bars. 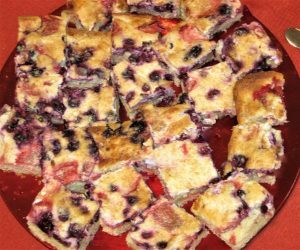 Substitute or variate between the blueberries with fresh raspberries, strawberries, blackberries or huckleberries.